Music is form of Art deep-rooted in Culture and History. The sounds, the melodies and the lyrics created by a songwriter carry his subjective vision of the world and each song gives you an deep insight of the Artist's cultural ties with his country. That's why listening to music can be considered as a very meaningful form of travel. A record can take you to places you've never seen before and make you discover the Culture of a country you've never visited. The members of JAZZANOVA understood it well. Always keen on sharing their passion and their experiences they released the music of Artists coming from all over the world on Sonar Kollektiv, notably with the compilation Paz e Futebol (SK089CD/LP) that gathers some of their favorite Brazilian tunes and the Jazz compilations Romanian Jazz (SK132LP) and Nueva Vision - Latin Jazz from the Cuban label Egrem / Areito (SK166CD). After the tremendous success of Paz e Futebol (SK089CD/LP) they decided to go one step further and to create a new collection called travel guide, as an invitation to travel and to expand your mind through the discovery of World Music. travel guide is Sonar Kollektiv's Lonely Planet for your ears and your soul. To inaugurate this new collection Sonar Kollektiv has the honour to re-issue the wonderful folk album Listen of of Brazilian singer-songwriter PAUL BRYAN aka SÉRGIO SÁ originally released in 1973 on the label Top Tape in Brazil. JAZZANOVA member JUERGEN VON KNOBLAUCH found the LP while record digging in Berlin 9 years ago. He played it to the rest of the collective and they all instantly fell for it. Listen Of is also a real collectors' item almost impossible to find outside Brazil. This re-release is thus a gift to all those, who have been looking for it in vain up to now. Discovering that Listen Of , which is an album of singer-songwriter folk guitar songs in English, has in fact been produced and arranged by a Brazilian Artist has been quite a surprise for JUERGEN and there is an interesting story behind it. PAUL BRYAN is the pseudonym that Brazilian artist and musician SÉRGIO SÁ used to produce an album of British and American influenced folk tunes. SÉRGIO SÁ is a blind-born keyboard player with a long and successful musical career in Brazil as composer, producer and arranger. Born in Fortaleza, SÉRGIO moved to Sao Paulo at the age 13 to continue his studies. He finished his primary school at a special school directed by a blind professor as well. SÉRGIO stayed for one year at the Instituto Padre Chico in Sao Paulo. At Padre Chico, since he was already a self-taught musician and played piano 'by ear', he applied to music courses as an extra-curricular activity. It was in that moment that he had his first contacts with musical theory, harmonies and rhythms. SÉRGIO considers that the lucid way in which he learned music, made him more creative, audacious and opened his way to more possibilities. In 1973 he was incited by the company Top Tape of Rio De Janeiro to enter a team of composers that were creating songs for soap operas. Top Tape also asked him to create an album of English spoken folk songs. SERGIO adopted the name PAUL BRYAN and created Listen Of. Following the outstanding success of the album SÉRGIO became requested for musical arrangements and recordings as keyboard player. He recorded with famous artists like 'the king' ROBERTO CARLOS, GILBERTO GIL, SIMONE, TIM MAIA, HERMETO PASCHOAL, FÁBIO JÚNIOR, JANE DUBOC and THE TRAPALHOES amongst many others. In his journey SÉRGIO has had the opportunity to live in the USA, a place where his learning and professionalism strengthened. For 3 years, during the 80s, SÉRGIO worked in LA and Washington. He had the chance to work there for STEVIE WONDER and to create a few songs for him. Not only successful as an artist and musician, SÉRGIO is also the author of 2 books notably Close your eyes to see better - the limit of the senses and the senses of the limits, where he exposes his ideas to create new ways of seeing, hearing, feeling and dealing with the world, and Factory of sounds, which is a study about sound production based on his musical experience and prefaced by the Minister of Culture and Brasil legend, GILBERTO GIL. The life of SÉRGIO is made of constant and strenuous efforts to reach his dreams and based on the belief that one should always look on the bright side of life. He would not have been so successful without this exceptional optimism. The name PAUL BRYAN comes from an American TV-series called Iron Soul, where the character PAUL BRYAN was a patient suffering from a terminal desease. SÉRGIO was moved by this series and the strong will of this character. To compose the songs of Listen Of, SÉRGIO found his inspiration in the music of THE BEATLES, LENNON and MC CARTNEY on the one hand and hits of the American Motown label and artists such as JACKSON 5, DIANA ROSS and STEVIE WONDER on the other hand. The romantic ballad Listen was the first song SÉRGIO wrote. It peaked up the Brazilian charts in 1973. In the same year SÉRGIO co-authored the hit Don't Say Goodbye with CHRYSTIAN. 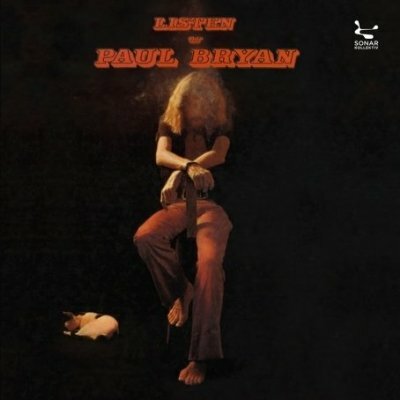 The second hit of Listen Of PAUL BRYAN was Window. It was used in a Brazilian soap as well. SÉRGIO recorded 12 songs in total for Listen Of. The record also includes the songs Like A Rainy Night, which is one of JAZZANOVA favorites, the wonderful tune Feel Like I Feel that refers to SÉRGIO blindness - "My days are darker than your nights, so hear my song and understand" - and Old Rock that SÉRGIO wrote with the music of the BEATLES and PAUL MC CARTNEY in mind. Listen Of has been a huge success and sold more than150 000 copies in Brazil alone. As the time goes by this record has been forgotten but it was without counting on JAZZANOVA, who proudly re-release it on Sonar Kollektiv 35 years after! And after all those years Listen Of is still a beautiful and soothing record of ballads and romantic songs. And like JAZZANOVA you will fall in love with PAUL BRYAN's Listen Of instantly too.